Preheat oven to 350 degrees F. Grease a 9 inch pie pan. Place melted butter, almond flour, coconut flour, Swerve, stevia and salt in a large bowl. Stir with a hand mixer to combine well. Use your fingers to press mixture into the bottom of the pie pan. Bake for 15 minutes or until lightly golden brown. Remove from oven and set aside to cool. Place the whipping cream into a chilled bowl and use a hand mixer to whip until stiff peaks form. Add the Swerve, softened mascarpone cheese and peanut butter. Use a hand mixer to combine well. Pour mixture into pre-baked shell. Set in fridge to cool and set up. To make the chocolate ganache: Place the cream and natural sweetener in a saucepan over medium heat. Bring to a simmer. Remove from heat and add the finely chopped chocolate, vanilla and salt. Stir with a whisk, then allow to sit for 3 minutes. Stir again until completely smooth. 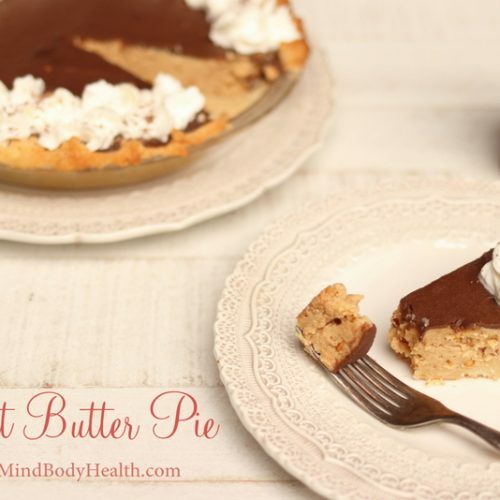 Place over cooled peanut butter pie and set in the fridge for 20 minutes to set. Garnish with Swerve-sweetened whipped cream and a sprinkle of Swerve-sweetened cocoa powder.